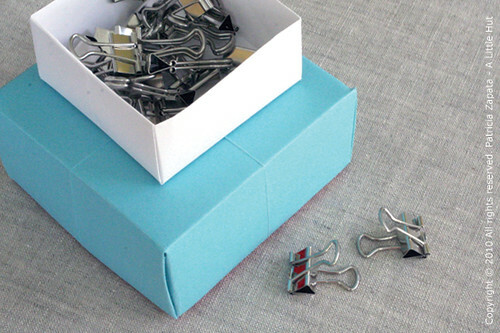 This is a very simple semi-origami tutorial on how to make a paper gift box. Many of you have probably made this box too. I don't even remember when my first one came about or who taught it to me. 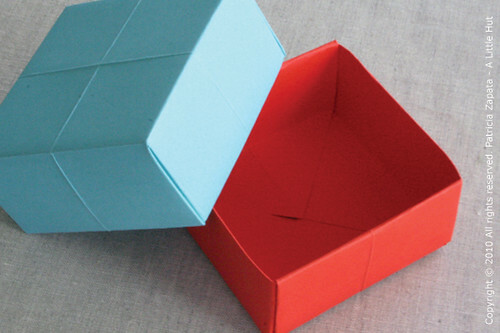 I know the conventional/origami way to make this box does not include cutting any of the paper (and this tutorial does) so that's why I hesitate to call it a real origami project. I decided to go ahead and show this as an alternate option. 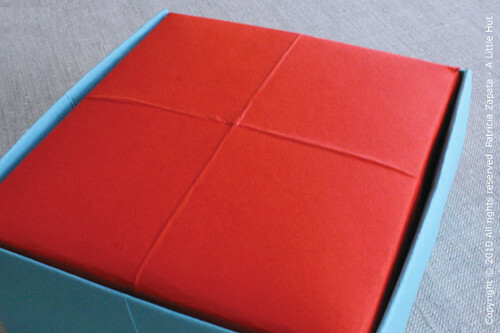 I made this project using the simplest of materials so that anyone can jump in and make it too. In this case, I used a letter-sized piece of paper that anyone has sitting in a printer. Interestingly a couple of days after I shot the video above there was a tutorial of an origami box (with no cuts) posted on the Craft blog. My little C has been sick and home with me the last couple of days. Today she was in the mood for something crafty so we worked on these boxes. She picked the contrasting colors for the larger box. It was made using 12" square (30cm) sheet of card stock. The difference in sturdiness when using a regular text weight sheet of paper vs. this card stock is significant. The thicker the paper the more necessary it is to use a bone folder. Based on the above you can see that the box that you create will be 1/3 the size of the sheet of paper that you start with. The height is about half of the width. The inside red box is smaller and fits in the blue one because I made the width of the square 1/4" smaller. I like using thicker paper for this project because the markings, that are left behind by the folds, give a subtle texture to the surface of the box. Just to let you know... Since this has been a fairly crazy week so far, I haven't had time to work on The Basics post yet. I will be postponing that until next week and getting the rest of my to-dos in order again. Ahh... life. You just have to roll with it. Have a great day friends!